Local leaders and volunteers gathered at the Benedictine Monastery to celebrate all the hard work since the migrants arrived. 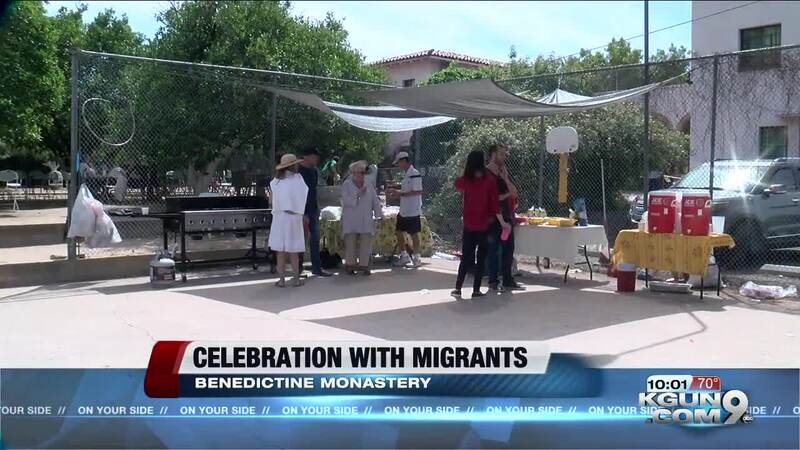 TUCSON, Ariz. — Local leaders and volunteers gathered at the Benedictine Monastery to celebrate all the hard work since the migrants arrived. Migrants have been staying at the Monastery for a couple months, with the help of volunteers committing time and people donating from the community. "Everyday that I leave here after thinking oh my goodness, we made it through again. Something small or really big, you know that we've done something really wonderful, not only for ourselves, but for the town and for all these lovely people coming in," Gaskill said. Both Mayor Jonathan Rothschild and Ward six Council Member Steve Kozachik went to the event to show their support. Kozachiki said this monastery makes a huge difference in the migrants lives, especially the kids. "The children that you see playing around here, this is the first time in forever that they've had an opportunity to just be kids," Kozachiki said. Volunteers said all the long hours have been worth it. "The look on their face is just one of gratefulness, and the hugs that you get from them, just from giving them maybe a piece of fruit or a breakfast, they just think it's truly amazing," Gaskill said. The monastery will be open through the end of May, and volunteers said they're always accepting donations from the community.